We knew Mr. Moseley almost at the beginning of the Centro de Investigación de Objetos Voladores Inidentificados (C.I.O.V.I.) in Montevideo, Uruguay, around 1958-1959 and his publication, Saucer Smear. What follows is a brief summary of his life, taken from Wikepedia. The son of U.S. Army Major General George Van Horn Moseley, Moseley attended Princeton University for two years before dropping out. He became interested in UFOs following the 1947 claims of pilot Kenneth Arnold, but his interest deepened following the 1948 death of U.S. Air Force pilot Thomas Mantell in pursuit of a UFO. In July, 1954, Moseley co-founded Saucer News, a periodical known for its unorthodox, "freewheeling" (Clark, 2002) style. Saucer News only occasionally featured serious UFO research; Moseley was among the first to publicize evidence against the claims of leading "contactee" George Adamski. In 1953 he investigated the Ralph Horton flying saucer crash. Saucer News was sold to Gray Barker in 1968. 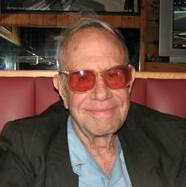 Moseley became a regular lecturer on UFOs for several years and organized an annual convention. In 1970, he founded a newsletter that went by several titles until Moseley settled on Saucer Smear in 1981. He produced the newsletter irregularly, and sold pdf issues and subscriptions from his website. Saucer Smear typically had a joking, gossipy tone. In 1984, Moseley established an antiques store in Key West, Florida. Moseley co-wrote a memoir with Karl T. Pflock, entitled Shockingly Close to the Truth! (2002). James Moseley died from cancer of the esophagus on November 16, 2012 at a hospital in Key West, Florida; he was 81 years old. 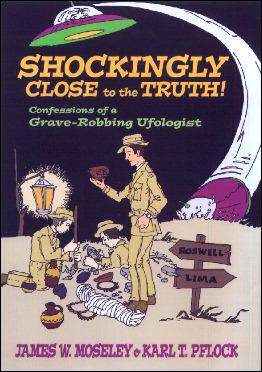 We sincerely regret the death of this outstanding personality in the Ufological world and reccomend the reading of his book Shockingly Close to the Truth! because it reveals many unknown things about people and organizations in the American Ufology.